Despite advancements in dental care, tooth loss is still a fact of life for many Americans. And until recently, the only treatment options for filling the gap in a smile were dentures or a bridge. But modern technology and materials have made permanent, fixed tooth replacements – called dental implants – possible. If you’re thinking about getting a dental implant, you probably have questions about the device and procedure; and we’ll answer many of the most common questions here. But remember, it’s important to talk with your dentist – he or she can give you the best advice based on your dental history and your needs. Dental implants are replacement tooth roots. They’re typically made of titanium, a material that is compatible with our bodies and can create a strong, sturdy foundation for replacement teeth. After an implant has been set in place, your jaw bone locks the implant into place by fusing to it, giving replacement teeth the stability and strength to withstand the daily grind (so to speak) and function like regular teeth. Implants provide a strong foundation for fixed or removable replacement teeth, and they’re made to match your natural teeth. What Advantages Do Dental Implants Have Over Bridges and Dentures? Dental implants look and feel like your natural teeth. And because they are designed to fuse with bone, they are permanent. With dentures, the teeth can slip within your mouth and affect your speech. Dental implants allow you to speak without worrying that your teeth might shift. Implants are comfortable and convenient. Because they become part of you, implants eliminate the discomfort and inconvenience of removable dentures – not to mention the messy adhesives needed to keep them in place. They make it easier to chew and eat because there is no chance of them sliding, like dentures. And because they’re implanted into your jaw, food won’t get trapped underneath, which may cause pain when you bite down. Dental implants don’t require reducing – or filing down – other teeth, as a tooth-supported bridge does. Because nearby teeth are not altered to support the implant, more of your own natural teeth are left intact, improving long-term oral health. 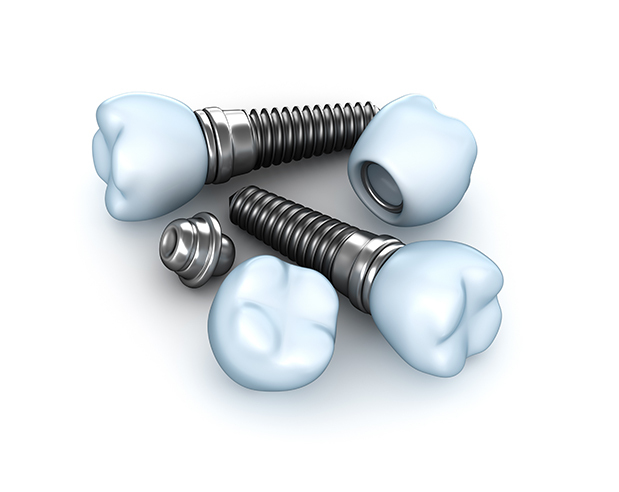 Because a dental implant will replace your tooth root, the bone is better preserved. With a bridge, some of the bone that previously surrounded the tooth begins to resorb (deteriorate), and gums can recede, leaving a visible defect when the metal base or collar of the bridge becomes exposed. Not only that, the cement holding the bridge in place can wash out, allowing bacteria to decay the teeth that anchor the bridge. Implants are extremely durable and are designed last many years. With good care, many implants last a lifetime. The average cost of dental implants in the United States is around $5,000. That is the out-of-pocket cost for the implant itself, the abutment, the crown, and the surgery. Some insurance plans will cover implants; check your individual dental plan for details. In most cases, anyone healthy enough to undergo a routine dental extraction or oral surgery is a good candidate for a dental implant. Patients should have healthy gums and enough bone to hold the implant in place. They also must be committed to good oral hygiene and regular dental visits. Smokers, those suffering from uncontrolled chronic disorders (such as diabetes or heart disease), or patients who have had radiation therapy to the head/neck area need to be evaluated on a case-by-case basis. The first step in getting a dental implant is developing an individual treatment plan. The plan addresses your specific needs and provides care based on the treatment option best for you. Next, the tooth root implant is placed into the bone socket of the missing tooth. As the jawbone heals, it grows around the implanted metal post, anchoring it securely in the jaw. The healing process can take from 6 to 12 weeks. Once the implant has bonded to the jawbone, a small connector called an abutment is attached to the post to securely hold the new tooth. Then your dentist makes impressions of your teeth and creates a model of your bite, which he or she will use to make the new tooth. The replacement tooth, called a crown, is made to blend in with the rest of your teeth and attached to the abutment. Note that some patients have attachments placed on the implant which support a removable denture instead of a crown. Is Getting an Implant Painful? Most people who have received dental implants say that there is very little discomfort. Local anesthesia numbs the area during the procedure, which many patients report to be less uncomfortable than a tooth extraction. Following the procedure, mild soreness can be treated with over-the-counter pain medications. How Do I Care for an Implant? This entry was posted in Periodontal Disease and tagged Gum Disease, Periodontics. Bookmark the permalink. Follow any comments here with the RSS feed for this post. Both comments and trackbacks are currently closed.